The Trail ICC has been in existence since 2011 and provides an excellent place for UBC medical students to complete their third year. Students that have been through the Trail ICC enjoy the independence of the program coupled with the support of staff and preceptors who they get to know very well. They particularly love the opportunity to do lots of hands-on work with only a small number of learners in the area at one time. The addition of a family medicine residency program in the Kootenay Boundary in 2015 has further enhanced the learning experience. As with any ICC program, being able to keep a strong work and study ethic away from the larger peer group is essential. Third year is a very important and busy year, no matter where you are placed. The following information will hopefully provide you with a taste of what you can expect if you join the Trail ICC program. More details can be obtained by attending the Year 3 ICC information sessions. The Trail Integrated Community Clerkship (ICC) program utilizes an educational model, similar to the Vernon ICC program, that optimizes continuity of teaching and patient care. The student support system is tailored to fit the needs of students to help them maximize learning opportunities and engage with the local medical community. The program provides four third-year clerkship spots each year. Past students have consistently given excellent feedback on the quality of their educational experiences and preceptors in the Trail program. It is necessary that students have access to their own vehicle to fully participate in the depth of learning opportunities as well as explore the numerous recreational pursuits available outside of their training. Each student is teamed with two family practice (FP) preceptors for two half days per week for the entire year. The FP preceptors act as primary preceptors, providing timely and consistent supervision and feedback. Students track patients across multiple disciplines to maximize learning experiences. They can follow patients from the FP office through to specialty consultations, community referrals, emergency department, hospital admissions and related in-patient care, operating room, and subsequent FP office follow-up. An ample patient volume and case mix ensures students see all required clinical encounters and perform all required procedures to meet Year 3 learning objectives. The student schedule consists of “mini-rotations” (1 to 3 weeks in duration) in all of the core specialties: anesthesiology, emergency medicine, general surgery, internal medicine, obstetrics/gynecology, orthopedics, pediatrics and psychiatry. Some of these rotations will be located in Nelson at Kootenay Lake Hospital. Most of these “mini-rotations” are repeated throughout the year. This step-wise learning allows students to build on past experiences and enhances learning and performance. Students are given graduated responsibility over the course of the year, depending on their abilities. Students benefit by participating in an interprofessional experience one half-day per week. Students have the opportunity to choose from a diversity of experiences in the community including chronic disease management, drug/addictions programs, industrial/occupational health, residential care and many others, within the hospital setting and in the community. Students also have the opportunity to gain additional experience in areas outside core disciplines (e.g. primary care obstetrics, pathology/lab medicine, radiology). Students participate in a minimum of one AHD teaching per week. AHD sessions are provided by local faculty from Vernon or Trail area and the students in Trail and Vernon videoconference for these half-day sessions for the entire year. Some of the teaching sessions are by videoconference whiles are dedicated for directed reading. KBRH i a 75 bed hospital, the largest diagnostic and acute care facility in the region. 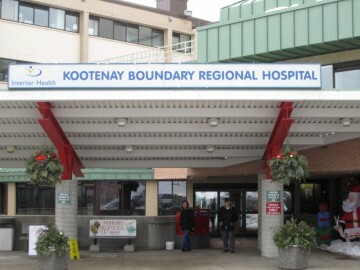 As a major referral centre in the Kootenay Boundary Health Services area, it serves as a catchment area for 75,000 people of the West Kootenay/Boundary communities. The hospital is home to a close-knit medical community with over 50 specialists representing anesthesia, emergency, otolaryngology, general surgery, internal medicine, obstetrics/gynaecology, ophthalmology, orthopedics, pathology/lab medicine, pediatrics, plastic surgery, psychiatry, radiology, and urology. KBRH also has 34 active family physicians and 11 hospitalists. There dedicated UBC education space (2000 ft²) that includes a centralized education area, clinical skills room, video conferencing rooms, on-call sleep area, and lounge. KLH is the acute care hospital in Nelson and serves patients from Nelson and the surrounding communities around Kootenay Lake. Students will spend time in KLH doing specialist rotations in pediatrics, internal medicine and some students will complete obstetrics/gynaecology rotations at the hospital. Nelson is 70 km from Trail and the drive along the Kootenay river is very picturesque. The road can be a bit challenging in the winter and a good, reliable vehicle and winter tires are necessary. The medical community in Nelson has a long history of educating medical students and the students really enjoy and appreciate their time at KLH and Nelson. There is also dedicated UBC education space (645 ft²) with a clinical skills room, study stations, and lounge area. The Greater Trail area has a population of 30,000 people centered in five communities, each with its own flavour (www.southkootenay.com). With a population of 10,000, Trail is the economic hub of the region and boasts wonderful parks and recreational facilities (www.trail.ca). There is an aquatic centre, baseball stadium, two ice arenas, indoor field house, curling rink, tennis and squash courts, and several soccer pitches. Sport plays an integral role in Trail as evidenced by its ranking as the #1 Sports Town in BC by the Vancouver Province. The Columbia River runs through the city thus fishing and kayaking are popular activities. Rossland, Canada’s Alpine City (www.rossland.ca), was named one of North America’s “Top 10 Great Adventure Towns to Live and Play” by National Geographic magazine. In the winter, check out Red Mountain (www.redresort.com) or Blackjack cross country ski club (www.skiblackjack.ca). Summertime allows hikers and bikers access to the hundreds of kilometres of maintained trails (www.rosslandtrails.ca) around town. There are numerous lakes for paddling and swimming. Nelson sits on Kootenay Lake and is surrounded by beautiful mountain ranges for all kinds of outdoor pursuits. White Water ski resort and numerous cross country and back country skiing opportunities also exist. The Trail Regional Airport offers daily service to Vancouver (Pacific Coastal Airlines) and the West Kootenay Regional Airport offers daily service to Vancouver and Calgary (Air Canada).